Background: We investigated the relationship between intraprocedural angiographic and echocardiographic AR severity after TAVI, and the clinical robustness of angiographic assessment. 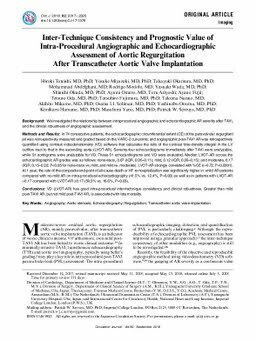 Methods and Results: In 74 consecutive patients, the echocardiographic circumferential extent (CE) of the paravalvular regurgitant jet was retrospectively measured and graded based on the VARC-2 cut-points; and angiographic post-TAVI AR was retrospectively quantified using contrast videodensitometry (VD) software that calculates the ratio of the contrast time-density integral in the LV outflow tract to that in the ascending aorta (LVOT-AR). Seventy-four echocardiograms immediately after TAVI were analyzable, while 51 aortograms were analyzable for VD. These 51 echocardiograms and VD were evaluated. Median LVOT-AR across the echocardiographic AR grades was as follows: none-trace, 0.07 (IQR, 0.05–0.11); mild, 0.12 (IQR, 0.09–0.15); and moderate, 0.17 (IQR, 0.15–0.22; P<0.05 for none-trace vs. mild, and mild vs. moderate). LVOT-AR strongly correlated with %CE (r=0.72, P<0.0001). At 1 year, the rate of the composite end-point of all-cause death or HF re-hospitalization was significantly higher in >mild AR patients compared with no-mild AR on intra-procedural echocardiography (41.5% vs. 12.4%, P=0.03) as well as in patients with LVOT-AR >0.17 compared with LVOT-AR ≤0.17 (59.5% vs. 16.6%, P=0.03). Conclusions: VD (LVOT-AR) has good intra-procedural inter-technique consistency and clinical robustness. Greater than mild post-TAVI AR, but not mild post-TAVI AR, is associated with late mortality.